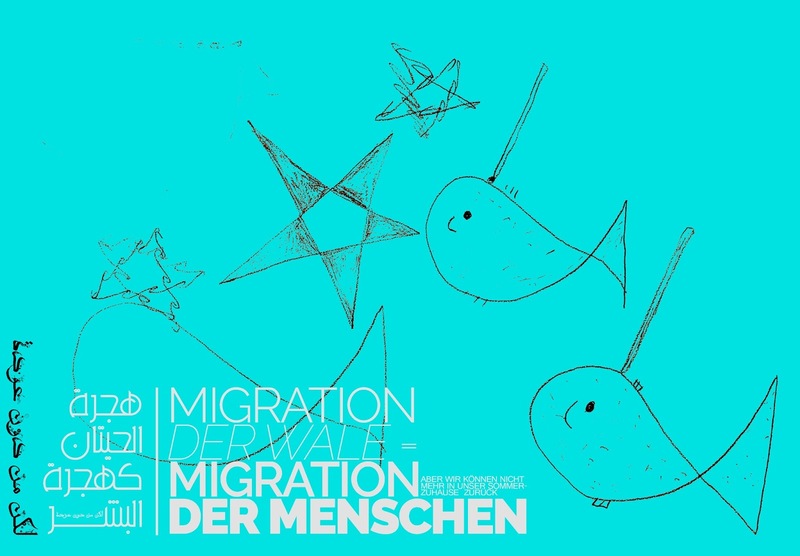 House without Walls is an exhibition of drawings by refugee children in Berlin, made with British visual poet Philip Davenport, from arthur+martha. The exhibition opens 13 October, at Paul-Schneider-Haus in Spandau, Berlin, and continues until 23 November (Mon-Fri 10-6). The drawings show a child's everyday, but with the sharpness of war punching through. A policeman with a truncheon hides in one corner of 'A normal day'. A mother walks through a field equally divided between trees and explosions. Several of the drawings have been made into "poster poems", with responses from parents and adults in their community incorporated into the designs. 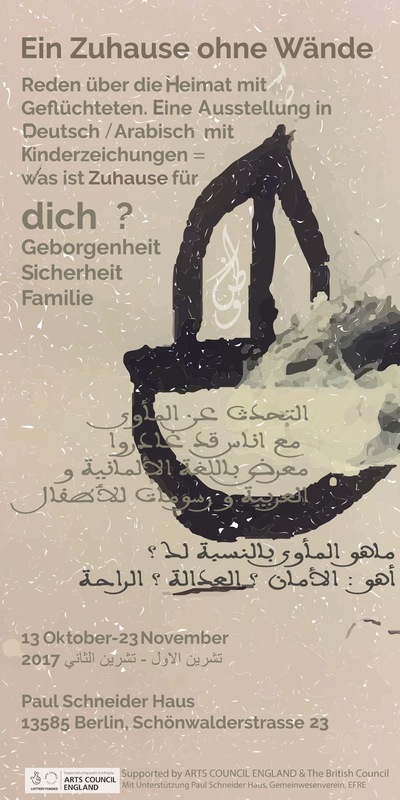 The poster poems, made in collaboration with Syrian designer Deya Nemo, are a gentle, sideways look at the human cost of war, the subtle losses, including childhood itself. The text layers three languages together: Arabic, German and English, a diverse echoing of voices. The naivety of the drawings contrast with the questioning of adults. Sharp and cynical, though still child-like, these conversation pieces between children and adults continually ask: where are we now? Davenport's workshops took place in the busy corridor of the Staakener Strasse asylum seekers' shelter in Spandau, Berlin. He directed weekly sessions, over a period of 6 months, getting the children’s energy down on paper, an act of creation and of release. They attacked the paper on occasions. One boy had such shaky hands that his drawings were almost those of an old man. Davenport describes the workshops: "A blast of energy, full of delight, mischief - but a certain brittleness too. As I slowly got to know the children I began to understand the cost of the epic life journey they'd taken, to reach safety here in Berlin..."
Davenport also interviewed many older members of the community at Staakener Strasse, weaving their thoughts into the work. The interviews and a diary of the project are at this link. Funded by The British Council/Arts Council England. 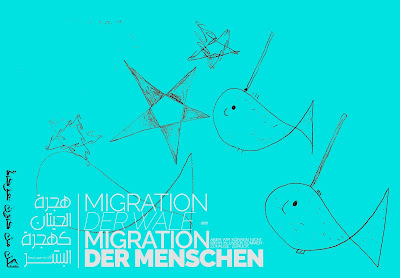 Supported by Paul Schneider Haus, Gemeinwesenverein Haselhorst e.V., EFRE, Gemeinschaftsunterkunft Staakener Straße, Spandau, Berlin, arthur+martha U.K.
Translations by Deya Nemo, Lisa Langer and Aurelie Maurin. Thanks to all at Gemeinschaftsunterkunft Staakener Straße, Barbara Caveng and Dachil Sado at Kunstasyl, Wiebke Ehrenstein at Paul-Schneider-Haus, Elke Ritt at The British Council in Berlin, and poets Alistair Noon, Pierre Joris and Habib Tengour. An arthur+martha international outreach project.